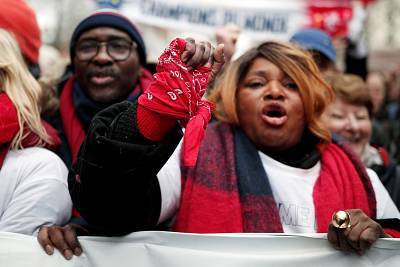 PARIS — Some 10,000 people wearing red scarves marched through Paris on Sunday to protest acts of violence and vandalism on the sidelines of anti-government demonstrations by the largely peaceful "yellow vest" movement. The "red scarves" demonstration came amid growing divisions around the 11-week-old "yellow vest" phenomenon, which has led to rioting in Paris and other cities, exposed deep discontent with President Emmanuel Macron and prompted national soul-searching. Protest damage to the Arc de Triomphe monument in Paris in December was a turning point for many of the counter-protesters at Sunday's march. "We don't share all the demands expressed by the 'yellow vest' movement, for instance demands about overthrowing the government, brutalizing institutions," Laurent Segnis, a member of Macron's centrist Republic on the Move party, said. Others lamented their sense that the "yellow vest" movement — which appeared in mid-November as a grassroots response to a fuel tax rise — is radicalizing as it approaches February. Sunday's protesters wore red scarves or bright blue vests as a way to appropriate the "yellow vest" movement's brightly colored symbol of discontent. 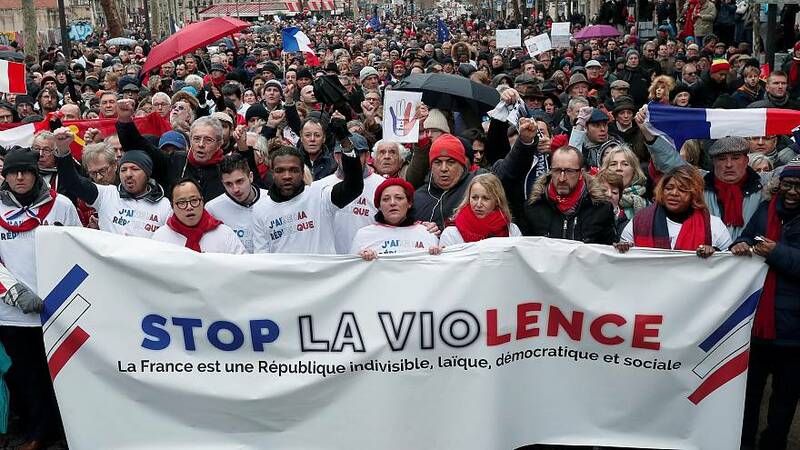 The movement and its protests are named after the high-visibility garments French drivers must carry in their vehicles in case of emergency. Some 2,000 people have been injured in protests since the movement began Nov. 17, notably as weekly demonstrations in Paris routinely descend into clashes between riot police and participants who throw rocks at officers and set fires in the streets. Separately, 10 people have died in road incidents related to yellow vest blockades. The "yellow vest" movement, which includes people across France's political spectrum, sees Macron's government as favoring the wealthy. Many movement supporters dismissed the "red scarves" as Macron stooges, though the president's party didn't officially take part in the counter-demonstrations. To help quell discontent, Macron this month launched a series of public debates that he has promised will lead to changes. Some 69,000 people nationwide took part Saturday in the 11th week of "yellow vest" protests, down from more than 80,000 during the previous two weekends, according to the French Interior Ministry. The protests in Paris were scattered, with different groups staging events at different sites.